Editing Wikipedia: Better with friends, and best with librarians! This post was written by guest author Sara Snyder, Webmaster at the Archives of American Art. Have you ever tried to write or edit a Wikipedia article? It can be really a fun and rewarding experience, especially for library, archives, or museum professionals, since we are often passionately dedicated to sharing knowledge. If you have tried it, then you already know that it is not easy for newcomers to just jump in and start editing. The design of the wiki interface can be intimidating, and the norms and rules of the Wikipedia online community can be mystifying. New editors often have their work changed or reverted, which frustrates them. Although I wrote my first Wikipedia article over six years ago, only recently did I started feeling confident and welcome enough to begin contributing on a regular basis. The reason for my new attitude? I met some awesome Wikipedia editors in real life who taught me the intricacies of the medium. They looked over my shoulder, answered my questions, and reminded me that my contributions and expertise as an archivist are valued by the Wikipedia community. They also introduced me to WikiProject GLAM, a global movement where librarians, archivists, and museum folks are working with Wikipedia for mutual benefit. In-person connections and support make a huge difference when you are learning to edit Wikipedia. More/better contributors means a higher quality encyclopedia, which ultimately benefits the hundreds of millions (you read that number right) of researchers, students, and lifelong learners who visit it every month. 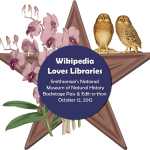 That is why I am proud to say that the Smithsonian has emerged as a leader in facilitating connections between librarians, archivists, and museum professionals and the Wikipedia community. 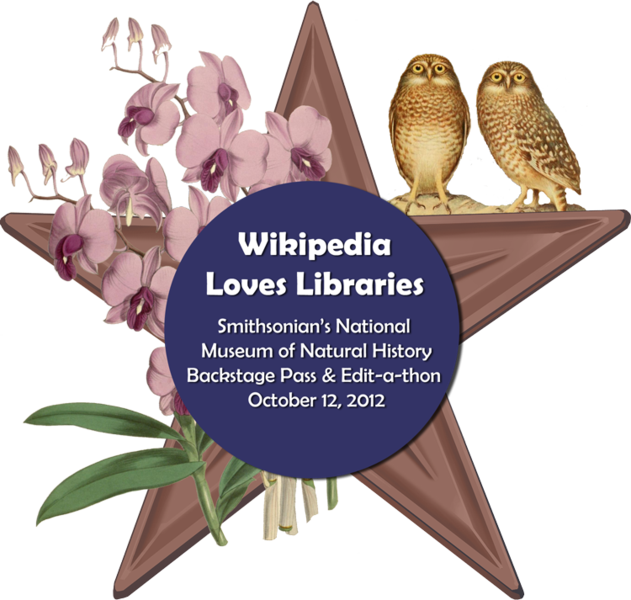 The latest example: on October 12, 2012, the Smithsonian hosted its fifth and largest Wikipedia workshop and edit-a-thon to date (an edit-a-thon is when a group gathers in person to work on Wikipedia articles). Staff from across the Smithsonian worked with local Wikimedia volunteers to organize a daylong event, “Backstage at the Smithsonian Libraries.” Around 40 people–a fairly even mix of Smithsonian staff and non-staff– gathered in the main library in the National Museum of Natural History. The Smithsonian Institution Libraries and the Wikimedia DC chapter generously provided food and drinks to keep the volunteers energized. Wikimedia expert Jim Hayes introduced the crowd to the idea behind Wikipedia Loves Libraries, an annual continent-wide campaign to improve Wikimedia engagement with libraries (and archives), of which our event was a part. He also gave an overview of issues related to conflict of interest, notability, and how to cite reliable sources in Wikipedia. I followed Jim by presenting my own tutorial for new editors, a practical, hands-on effort to build confidence and familiarize my professional peers with the standards and best practices of contributing to Wikipedia. Other highlights included a series of “Backstage Tours,” visits to areas of the libraries and museum normally off limits to the casual visitor, and an afternoon edit-a-thon, where people could choose to work on whatever articles or topics they found most attractive (we offered a to-do list for inspiration). The results of the day included at least seven new user accounts registered, four new articles published (with a few more pending), edits or improvements to at least 34 existing articles, and 20 new contributions of media to the Wikimedia Commons. It was an amazing day, a great learning opportunity, and a thousand times more fun than editing Wikipedia at home, alone, in one’s pajamas. OK, well, that is actually pretty fun too. Great article Sarah. I’ve often wondered what it would be like to write a Wikipedia article and your article gave me a sense of the experience. I’m astounded that there are hundreds of millions of visitors to Wikipedia. Hats off to Smithsonian for its leadership in this field. This is such a fascinating area of research. I have used Wikipedia frequently while preparing my website Music Theory Online often just for clarification on some of the finer points theory. Thanks again Sarah, I found your article extremely interesting. I hope you don’t mind if I send some traffic your way and share some of my colleagues and friends. I visit Wikipedia every day, and really appreciate the high quality content I find there. Thanks for your contributions! Thank goodness Wikipedia isn’t infected with bias and sloppiness and just plain garbage like much of the internet! Thank you for sharing this blog! Just what I’ve been searching for. Great info! Unfortunately, Wikipedia is infected with bias. That is why I always suggest going directly to the source. If you see information in an article you want to take as fact, scroll to the bottom of the page under the reference section and read the source of the information. You can then determine if the information in the Wikipedia article is fact or crap.